Here’s another finished illustration from my Plus France, Sil Vous Plait: Ways to be More French book idea. In honor of this fact, which I should find out the history of, I decided that if I was to hire a musician to play for me on my way to the market, while I’m eating dinner, or doing mundane tasks, it could bring me back to my fun times in France and it would add a Frenchie feeling to my Americane life. 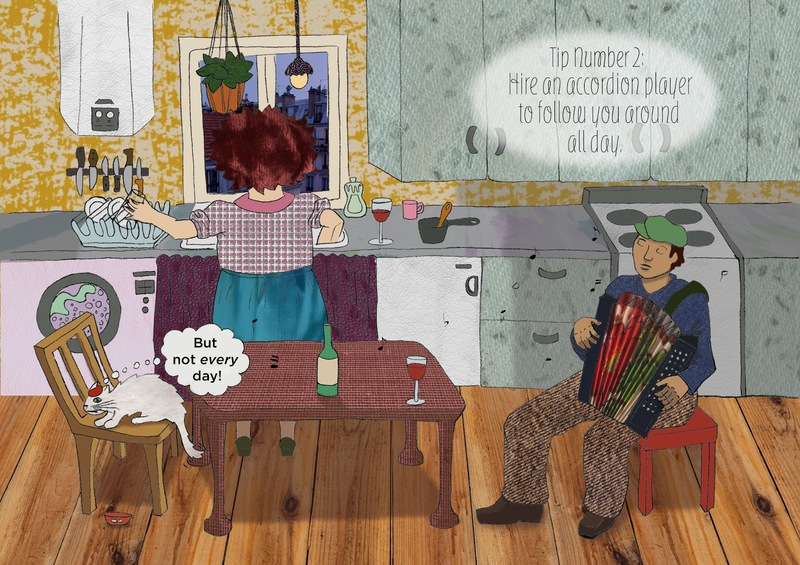 I’ve depicted this concept with Adele and Henrí in their kitchen and the accordion player that Adele has hired. Unfortunately Henrí doesn’t seem to be enjoying it so well since the accordion isn’t a very cat-friendly instrument.